I’m happy to introduce our newest felt food pattern, Breakfast in Bed! Get the Breakfast in Bed Pattern here! ★Pattern comes complete with full Scale Patterns for each piece. What a darling idea! I just wanted to thank you so much for the awesome curriculum! I just downloaded all of the lessons and I am so excited! Also, the lesson plan is going to be a huge life saver for me. I am starting a day care in a month and this is exactly what I was looking for. You are brilliant! This is awesome and i'll likely repost your link. I just love those! I'd like to get some parent volunteers together to make these for my classroom. I like these better than the hard plastic foods that come from catalogs. congrats on the Etsy store! Love the pattern! 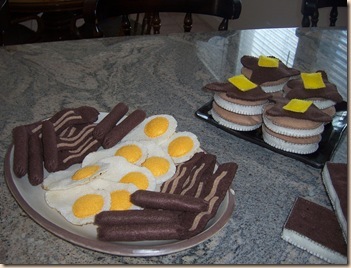 Is there a type of stuffing you would recommend for the breakfast felt foods? I'm not very well versed in the world of sewing…. thanks!